As Powerstroke problems go, a 7.3 Powerstroke water pump leak is one of the worst. Any water pump leak can go from annoying to catastrophic in a hurry. Not to mention that antifreeze/coolant is highly corrosive and can eat away at anything it's leaking onto, especially rubber or silicone components. DISCLAIMER/WARNING: Wear proper hand and eye protection as the corrosive nature of coolant escaping from the cooling system is hazardous to your skin and eyes. When I first took shipment of my 2002 Ford 7.3 diesel Powerstroke, the temp gauge needle would never go past about 1/8 above "C" (cold). And to top it off, my cab wouldn't heat up. Some Internet research pointed to a 7.3 thermostat that was probably stuck open, allowing cold coolant to constantly circulate through the engine. Going in to replace the thermostat, I found that the steel OEM thermostat housing was rusted badly. After 207K miles, I wasn't surprised. And that had probably caused my thermostat to stick open—fail. Regardless, I replaced the thermostat AND the thermostat housing and that fixed that particular problem. But as is often the case with 7.3 Powerstroke problems, when you fix one thing another thing decides it's going to break. By re-pressurizing the coolant system, increased stress was placed on the old 7.3 water pump gasket and it started leaking my nice new, pretty pink coolant all around the edge of the water pump. I figured at 207,000 miles it was time for a new water pump for my trusty 7.3 Powerstroke anyway. Before we tackle your own 2000, 2001, or 2002 7.3 Powerstroke water pump leak, a few things are constant no matter what year 7.3 Ford diesel Powerstroke water pump you're dealing with. In simplest terms, your 7.3 water pump pushes coolant from the radiator through the coolant hoses, into the engine and back around to the radiator by way of an internal impeller. The heat that the coolant picks up from the engine is transferred to the cool air passing over the fins at the radiator. Then the cycle of cold-hot transfer continually cooling your 7.3 diesel engine repeats itself. 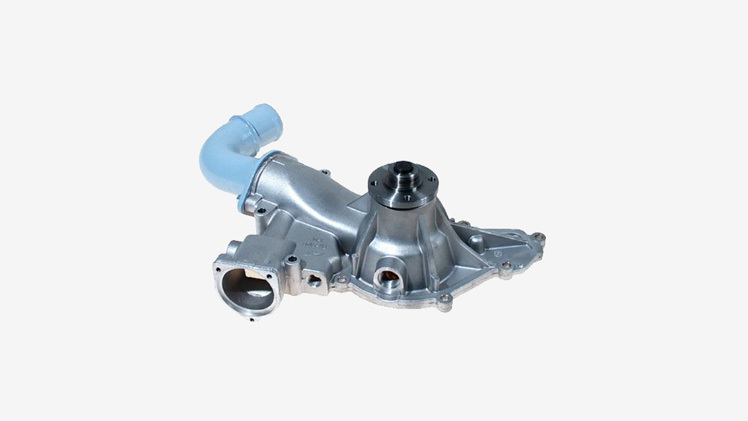 This system of radiator, upper and lower radiator hoses, thermostat, thermostat housing, coolant temp sensor, and the other internal coolant delivery components is all powered by the flow of coolant that the 7.3 Powerstroke water pump provides. And excessive heat buildup due to a water pump leak, or a leak or failure in any of the other components is one of the things that can kill your diesel engine faster than towing uphill in the desert. Because though your 7.3 diesel engine operates most efficiently when it's heated up, it doesn't love too much heat. Bar none, IMO, your "best" choice for any type of part is the one that fits your budget, makes your truck run, and doesn't fail prematurely. That being said, everyone has favorites. Some 7.3 fans swear that you should ONLY use OEM parts in your 7.3 Powerstroke. For those of you that subscribe to that philosophy, see the post and link to a 7.3 OEM Powerstroke water pump from Amazon at the top of this article. Better yet, if you can get a good 7.3 Powerstroke water pump that's been installed, tested, and reviewed by other 7.3 diesel owners, why wouldn't you? After reading and re-reading a ton of forums posts, blogs, and product reviews, I decided on a Gates replacement 7.3 water pump from Amazon to replace my 2002 7.3 diesel's leaking water pump. Is it the best? My 7.3 water pump leak's fixed for under a hundred bucks and a few hours of my labor. And my truck's still humming along. However, I understand skepticism—I'm an old salt "why should I trust you" kinda guy—so, here are the top 3 "best" water pump for 7.3 diesel Powerstroke alternatives I could find. **Make sure you verify fitment for your 7.3 diesel model year by checking the serial number of your vehicle. 7.3 water pump seals are dynamic—during cranking they expand and contract. Because of that, Ford added a reservoir just below your diesel water pump bearing. It's designed to catch small amounts of seepage and evaporate it. When the water pump bearing seal is failing, more "natural" seepage than can evaporate escapes. At that point, the weep hole in that reservoir will start to drip liquid coolant. That's one of the first signs that your 7.3 water pump is leaking/failing. The large gasket that is around the entire mounting face of the water pump. This was my problem and as bright red coolant leaked from the entire edge of my water pump, it burned up on the heat from the engine components and left a pink chalky residue around my water pump. Another common location for a water pump leak is at the thermostat housing. This housing is made of cheap metal and will rust and leak over the life of your diesel engine. And yet another is the 7.3 water pump inlet gasket. Ford 7.3 water pump replacement can cost anywhere from $75 if you're going to DIY it all yourself with an aftermarket 7.3 water pump ... to $500 and up which would include a roughly $200 OEM water pump plus a couple hours of labor at your shop's labor rate. In CA, I pay $185/hr at the dealer for labor. On a 2 hour water pump job that can get expensive. Add in the actual part and I'm now paying $500-600 to get a $75 part installed. Nothing against dealer service, but I gotta DIY my own 7.3 water pump leak problems for that price. Change multiple parts at the same time to save on labor. Any time I'm doing a majorly labor intensive repair on my 7.3, I ask myself what else I can afford to replace at the same time. Because most of the "cost" of repairing parts on your 7.3 is the labor involved in removing other engine parts just so you can get at the one you need to fix or replace. Repairing a 7.3 water pump leak will require that you remove a whole bunch of other parts that, in all likelihood, will need replacement as well. Thermostat - at 207,000 miles mine was frozen open, preventing my engine from operating at its most efficient temp. Not to mention my cab wouldn't heat up. I replaced mine with this one on Amazon—Part#F6TZ-8575-EA. That PN supersedes Ford Part#F6TZ-8575-AA (list of 7.3 thermostats on eBay). Serpentine Belt - I purchased this Gates 7.3 serpentine belt from Amazon after an unfortunate New Year's Eve incident that left me stranded when my serp belt flew off... It's another story. Coolant Temp Sensor - When I pulled my coolant temp sensor from the old water pump, it was an oily mess and the sealant material on the threads was shot. So I replaced it with this 7.3 coolant temp sensor from Amazon. There are several sensors replacements commonly marketed as being the coolant temp sensor. (The Engine Oil Temp (EOT) sensor is the most common). However, the above coolant sensor is the correct aftermarket replacement (with the correct resistance values) for a1998.5-2003.5, 7.3 Powerstroke diesel. (Alternatively, here's a list of "OEM" coolant temp sensors on eBay—Part# F65Z10884AA. Careful, not all of them are true OEM. You can spot the true OEMs as being about 4X the cost of an aftermarket one. If you're a weekend mechanic like I am, set aside a weekend to replace your 7.3 diesel's water pump. If all goes well, you'll be done in 2-3 hours. But if not, you'll need the weekend to drink away the pain of your bloody knuckles. A 7.3 diesel water pump leak will require that you drain the coolant from the radiator and degas bottle before you proceed with removing your water pump. Step 1 - Drain the coolant. I used a 5 gallon bucket to drain the coolant. My 2002 Ford F250 7.3 is lifted 4", so a 5 gallon bucket might not fit under your truck. Just use a container capable of holding 5 gallons, because that's what's gonna come out. Open the petcock—lower driver's side bottom of the radiator—until all the fluid drains from the radiator and degas bottle. Step 2 - Remove the lug wrench and jack tools. They're in the way of getting to the degas bottle bolts. The jack and lug wrench were both missing from my 2002 7.3 Diesel, so to fix my water pump leak I didn't have to mess with them. Step 3 - Disconnect the overflow hose from the degas bottle. It's on the right side and will probably require pliers to squeeze the clamp in order to work the hose off. Step 4 - Remove the three 8mm bolts holding the degas bottle. Then get the degas bottle out of your way. I had to use a socket extension on the lower ones. I also had to remove the hose on the bottom of the degas bottle in order to get the bottle to pull up and away from the radiator. Step 5 - Disconnect the upper radiator hose from the radiator. Vice grips or channel lock pliers will work on the clamp. Step 6 - Remove the serpentine belt. Use a 1/2" drive long breaker bar inserted into the slot on the tensioner pulley. Then pull on the bar, toward the passenger side, rotating the tensioner pulley counterclockwise, to relieve the tension on the belt so it can be removed. Careful not to unload the tensioner pulley too fast when you let it back down. Step 7 - Remove the two, 10mm bolts that hold the fan shroud. I like to do this before tackling the fan and fan clutch, because once they come loose, you'll want to get it all out and away from the radiator ASAP—the fan clutch is HEAVY. Step 8 - Remove the fan and fan clutch from the pulley. There are so many different methods to hold the pulley and remove the fan clutch... I used the mechanic "approved" air hammer method to loosen my own fan clutch nut. And I held the pulley from rotating by using the ratchet-strap method from the video below. Step 9 - Remove the fan, fan clutch, and fan shroud all at once. Lift them up and out being careful not to let them bang into the radiator fins and puncture it. The bottom of the shroud has 2 tabs that just lift out of their slots. Step 10 - At this point, you could remove the other end of the upper radiator hose. However, mine was stuck to the thermostat housing, so I waited until I removed the thermostat housing and tackled separating them once they were both out of the engine and easier to get to. Step 11 - Remove the three, 8mm thermostat housing bolts. Then remove the thermostat housing. After even 100,000 miles, your cheap metal housing will probably be rusted and likely need replacement. If you buy this Sinister Diesel billet thermostat housing from Amazon, it comes with new bolts. Step 12 - Remove the thermostat. Supposedly, it just "pulls right out" but mine was stuck in like a bear and had to be pried by inserting a flat head screwdriver and prying on it. If you plan on reusing your thermostat (I'd suggest replacing it) be careful getting it out. The thermostat gasket usually sits on top of an OEM thermostat, but some new thermostats come with the gasket integrated around the upper rim of the thermostat. Step 13 - Disconnect the heater hose. The heather hose comes out the top of the water pump and is to the left of the thermostat housing. Step 14 - Remove the two, 10mm bolts from the lower radiator hose outlet. The outlet's on the lower right hand wide of the water pump. Step 15 - Disconnect the engine coolant temperature (ECT) sensor connector. Step 16 - Disconnect the camshaft position sensor (CPS) electrical wiring harness from the water pump. Mine was zip-tied to an open hole in the water pump and had to be cut with wire cutters. Step 17 - Remove the four water pump pulley bolts. Then remove the water pump pulley. Step 18 - Loosen the heater up-pipe and the coolant temp sensor. I find it's easier to do this when the old pump is attached to the engine rather than wrestling with the old pump on the floor of my garage. Step 19 - FINALLY, Remove the 9 (yes, nine), 10mm bolts that attach the water pump. Careful—there are several different lengths, so keep track of which bolts go in which holes. To keep track of them, I laid mine out on the floor at the correct locations around the new water pump, then swapped the old water pump in the same place, and then installed them one at a time, mounting the new water pump. Step 20 - Carefully remove the water pump. Step 21 - Clean the surface of the engine around where the gasket material was. I used a rough kitchen sponge and a little plastic putty knife to GENTLY scrape the excess gasket material from the surface. Remember, everything's aluminum, so be gentle and don't mar the mating surface. Step 1 - Install the water pump-housing gasket on the 7.3 water pump. Put some grease or RTV on the gasket to help hold it in place. Step 2 - Install the water pump bolts and torque to spec (see torque specs below). Step 3 - Install the water pump inlet pipe with the two 10mm bolts. Don't forget the gasket. Step 5 - Install the heater hose and clamp it to the water pump. Step 7 - Install the water pump pulley and torque down the water pump pulley bolts. Step 8 - Install the serpentine belt. There should be a serpentine belt routing diagram sticker at the front of your engine bay. Step 10 - Install the fan shroud screws. Don't over tighten—they're going into plastic. Step 11- Install the fan and clutch assembly by screwing on the fan clutch nut—clockwise. Step 12 - Install the radiator coolant degas reservoir hose to the radiator. Step 13 - Install the upper radiator hose and clamps. If you got the dual-alternator upper radiator hose, there's a slot where you can either hose clamp it out of the way of the serpentine belt or use a zip-tie to do the same thing. Step 14 - Refill and "burp" the engine cooling system. Rough capacities for coolant are 4 gallons of pure coolant into the degas bottle and then top off with distilled water. However, if you didn't drain your coolant all the way—flush it—you'll need to test the mixture. 7.3 Thermostat Housing Bolts Torque - (11 ft/lbs or 110 INCH/lbs) The 3 bolts holding down the thermostat housing aren't in tight - BE CAREFUL WITH THESE AS THEY CAN BREAK EASILY. 7.3 Water Pump Inlet Hose Torque - (18 ft/lbs) Two bolts hold the steel water pump inlet tube to the water pump. It's the metal elbow coming from the lower right hand side of the water pump. 7.3 Fan Clutch Nut Torque - (83-113 ft/lbs) the fan clutch nut is on tight and it holds the fan and fan clutch to the water pump. Also, centripetal force—the water pump pulley spinning in the opposite direction of the fan clutch nut threads—constantly tightens the fan clutch nut. Which is why it's so hard to get off. Don't ignore a small leak in your Ford diesel 7.3 water pump. Small leaks around the water pump can turn into big leaks quickly. 7.3 water pump removal and replacement isn't rocket science, but it ain't easy either. Go slow, be methodical, and read, watch and learn before you tackle the job. As long as you're in there, consider replacing some other components in your 7.3 diesel Powerstroke's coolant system.